Last April there was a great celebration at the Ancona yard CRN which, during the first "Ferretti Group World Convention" launched the motoryacht "Saramour", a 46 metre of the "Magnifica" line. 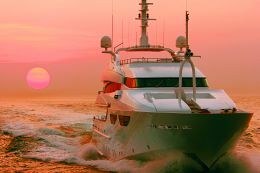 This Italian shipyard, since 1999 part of the Gruppo Ferretti, has been specialising in steel and aluminium custom yachts since its founding in 1963 by Sanzio Nicolini, becoming one of the leading sector producers on the international scene. Moreover, since 2002 CRN's brand positioning in the superyacht segment has been reinforced through union with Custom Line, another Gruppo Ferretti company, which is specialised in semi-custom yachts in composite material. Full load displacement: 410.000 Kg. Classification: LR Maltese Cross 100-A1 SSC Yacht Mono G6+LMC - MCA. "Saramour" is the 118th vessel to emerge from the Ancona yard, the result of a happy collaboration between the CRN internal technical department and the Nuvolari & Lenard design studio, with a contribution from the Aiello studio of Genoa which handled the interiors in accordance with the owner's passion for art. The thread running through every space aboard "Saramour" is in fact the presence of important art works, but more of that later. 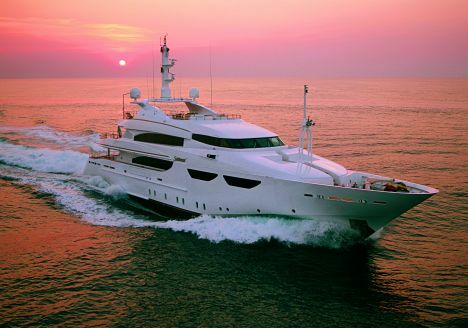 Externally this motoryacht is characterised by extreme cleanness of line and the typical form of the bow which CRN uses throughout its range. The view from the stern offers a scenario of what awaits us within. 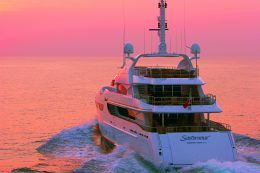 With the height of her four decks "Saramour" stands out on the sea like a work dedicated to beauty. The clean-cut and slightly curved surface of the transom, with a break in continuity, unites with the bulwarks which, running along the sides, join towards the bow with the upper deck in the configuration known as wide open. A side view shows the numerous smoked glass windows which on the one hand favour natural lighting for the interiors and on the other lighten the visual impact of the whole. What attracts the attention above all are the upright windows in the wide open zone, which give light to the owner's suite, and the two golden lines that follow the design of the upper decks. Observing from the bow, what stands out are the aerial holder appendages: the vertical support that develops in the forward area and the mast set above the flying bridge roll bar. 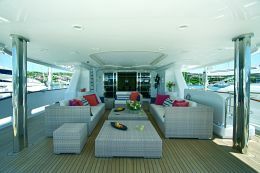 Now it's time for a virtual tour of the interiors, setting out from the lower deck and arriving at the flying bridge. The former is subdivided into sectors. 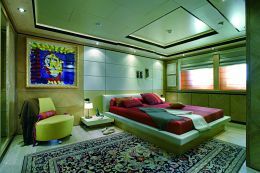 The crew's quarters forward consist of four double cabins with private bathrooms plus a galley and adjacent mess. 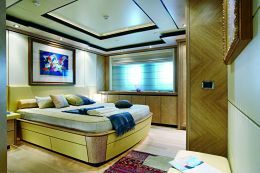 Aft of the crew's quarters is the guest area with one double bed cabin, one cabin with twin beds and a VIP cabin stretching over the entire beam which, among other things, features an oil on canvas by Appel. This zone includes a gym complete with Technogym equipment. 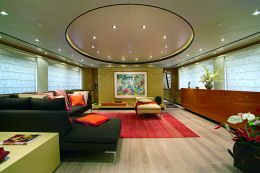 The furnishings of the lower deck, like the rest of the interior living areas, are distinguished by the choice of materials in warm, tenuous colours such as ivory, Cyprian yellow and orange for the fabrics and leathers, which are in suitable contrast with the pickled oak furniture and parquet in the same precious wood. 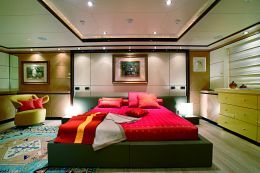 The area running approximately from amidships to the stern on this superyacht houses the technical area, which is to say the engine room, the garage for the tender and a central control unit of the vessel's vital parts. 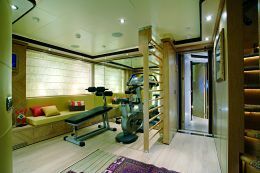 On the main deck we find a balanced distribution of living space between open air and interior zones. Externally it offers a very convivial area aft with sofas, coffee tables and poufs, ideal for evening cocktail parties or outdoor conversation. The interiors simply express art, understood as all the variants found in the dictionary. At the entrance you are immediately fascinated by the main saloon, furnished with a special sofa on the left, a low table and two modern Topkapi di Cassina armchairs, all matched with decorative elements such as the precious carpet and the ceramic plate on the wall, the work of French artist Boncopain. Continuing forward you come to the dining area where the predominant element is a painting by Karel Appel. 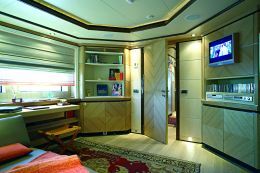 Then, on the left, a spacious galley in steel finish and, on the right, access to the owner's area which has a large office, a suite with relaxation corner, a wardrobe room and a bathroom with Jacuzzi. Here too the decoration is entrusted to art: paintings by De Chirico and Fiume, works by Venini and Zecchin and a glass sculpture from the Fucina degli Angeli in Murano embellish the night zone. The office walls are enriched with engravings by the Genoese artist Grechetto, while the bathroom décor consists of oriental carpets and refined ceramic tiles, the latter the work of Salvador Dalì. Forward on the upper deck the pilot house runs the entire beam. 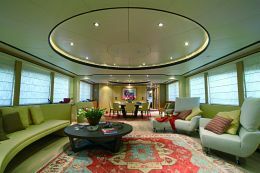 Here technology has the upper hand over refined furnishings, offering the skipper an enveloping chair from which to check the numerous monitors that back up the instrumentation and various integrated systems. In communication with the bridge there is the skipper's cabin with double bed and private bathroom. Aft there is an elegant sky lounge with corner sofa and chaise-longue, and with a painting inspired by early 20th century Russian abstractionism. This area communicates with a very convivial external zone, a terrace on the sea, ideal for outdoor meals. 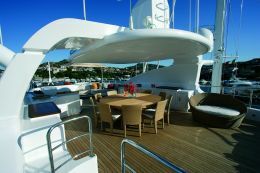 For lively conversation or simply to enjoy life aboard in complete relaxation there is a sundeck whose layout forward is complete with L-shaped sofas and a Jacuzzi while aft there is a dining table, a modern "shell" armchair and sun-beds. In conclusion we return to art, but this time applied to shipbuilding: the main expressions on this CRN are the displacement steel hull with bulbous bow and the modern aluminium structure, powered by two Caterpillars that can thrust the 410 ton "Saramour" along at a maximum speed of 16 knots.